Have You Seen Me? Giant Styrofoam Head Found : The Two-Way A huge plastic foam head floated up to a startled Marist College crew team practicing on the Hudson River this week. No one has come forward to claim it. Crew members from Marist College in Poughkeepsie, N.Y., were out practicing on the Hudson River this week when they were surprised by a gigantic head floating toward them. The head is about 7 feet tall and made out of plastic foam and fiberglass, the Poughkeepsie Journal says. It's missing a nose and has the appearance of Greek or Roman architecture. 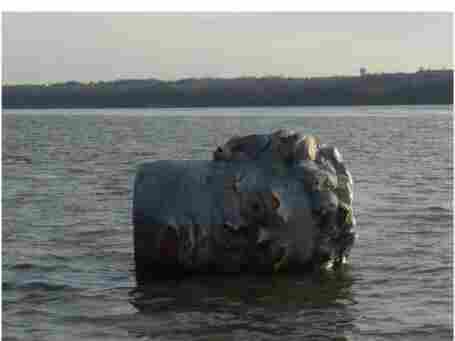 Marist College spokesman Greg Cannon told the newspaper that the huge item was lifted out of the water Monday, directly across from the school. No one so far has come forward to claim it. Matt Lavin, head coach of the college men's crew team, says there are two theories about how the huge head got there: "It's from a Mardi Gras float and got washed out to sea and to us — I think that's unlikely. The second and much more plausible [idea] in my opinion is that it came from a theater company up from the North — maybe Red Hook or Rhinebeck, N.Y."
But how it might have been washed out to sea or mislaid by an inattentive group of thespians is anyone's guess. Newsday says there's at least one social media user who slyly suggested the head is linked to "Ozymandias," Percy Bysshe Shelley's dramatic sonnet about an enormous crumbling statue. The poem speaks of a statue's "shattered visage" and declares, "Look on my works ye mighty, and despair!" Whether kingly or not, Lavin says, the head is staying put. "Right now, it's sitting outside the boathouse overlooking the river and we're planning to keep it," he says. "But other than that, I'm not sure what we'll do with it." Cannon gave Newsday another suggestion: "Maybe have the art students build a body for it, I don't know."